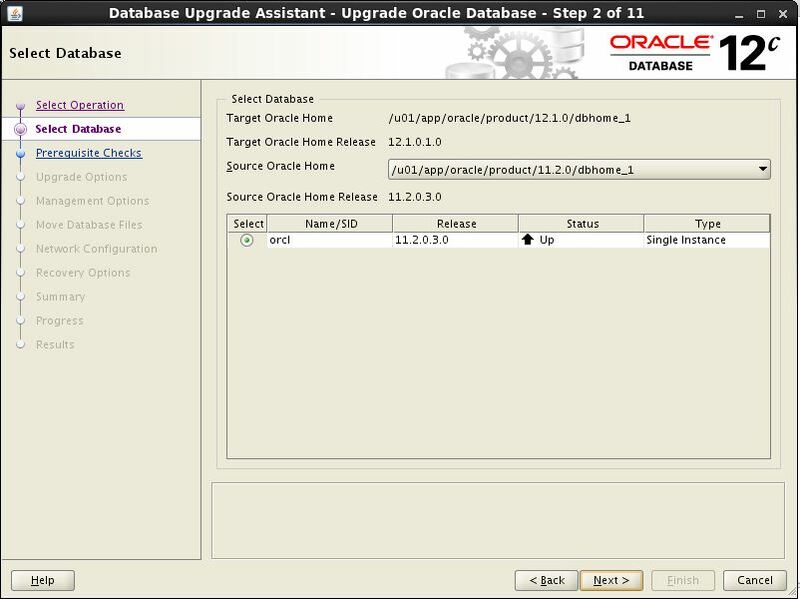 There are several methods available which can be used for Upgrading to Oracle Database 12c. You can choose the manual upgrade method, the export/import procedure, transportable tablespaces method or you can use the Database Upgrade Assistant (DBUA) graphical interface. Alternatively if you have a critical HA environment and cannot afford the downtime then you can use the Data Guard setup. However Oracle’s preferred and recommended method is the use of the DBCA. 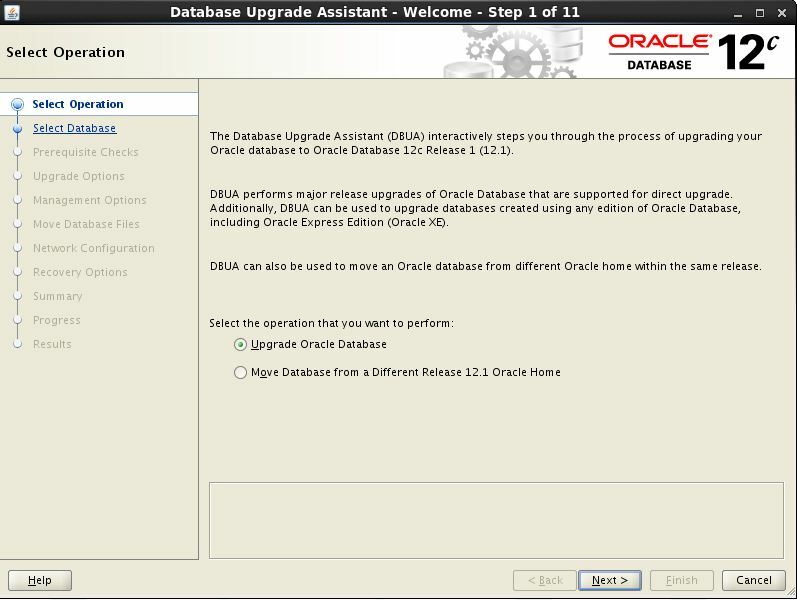 Here we will look at the DBCA and the manual upgrade method, upgrading an existing database from 11g to 12c. 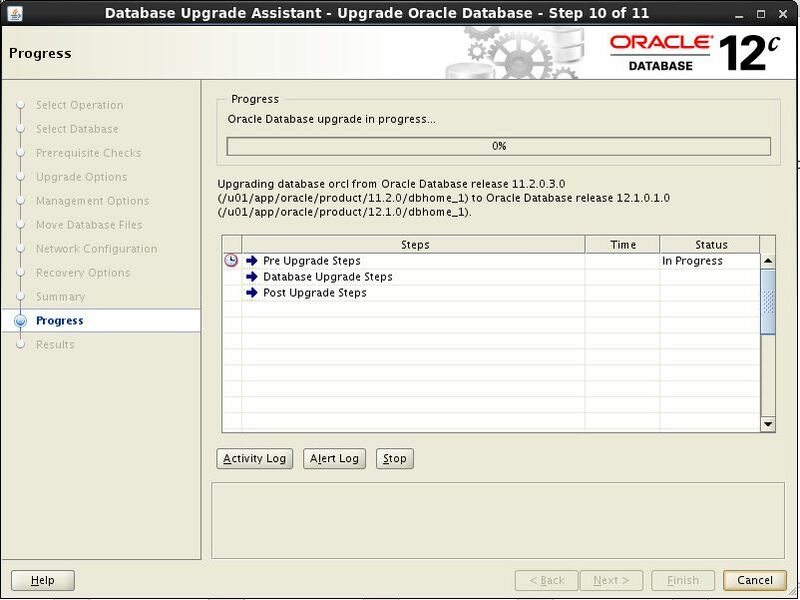 For a database to be able to be upgraded directly to 12c, it must already be at the 10.2.0.5+, 11.1.0.7+ or the 11.2.0.2+ version. 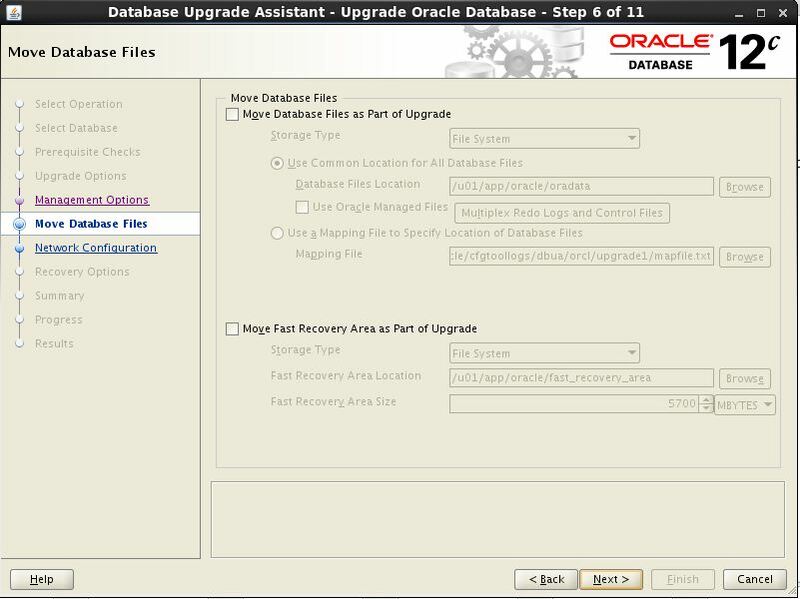 If you have a database running at any other version then you have to use the indirect approach of first upgrading it to a supported version above and then you will be able to upgrade it to 12c. 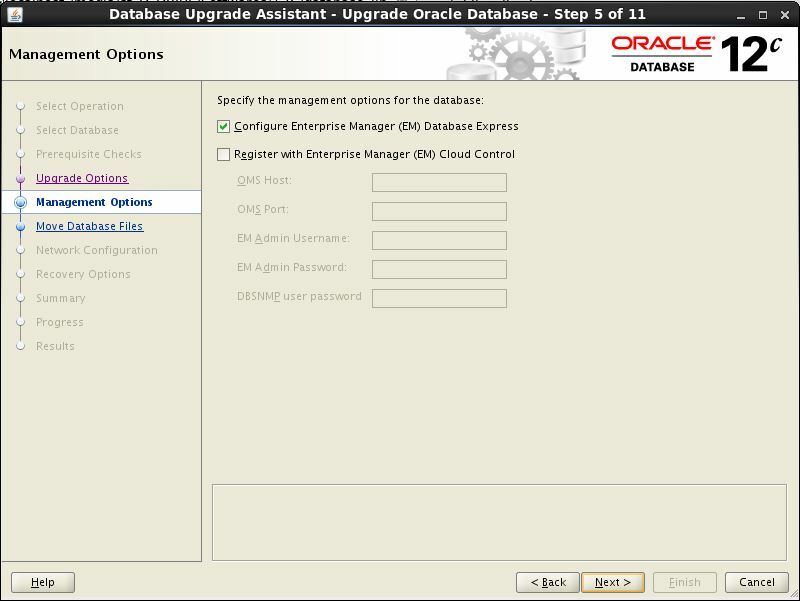 Here we will be performing a straight upgrade of the database from 11g to 12c and to a non-CDB database. The PDB conversion can be done later. 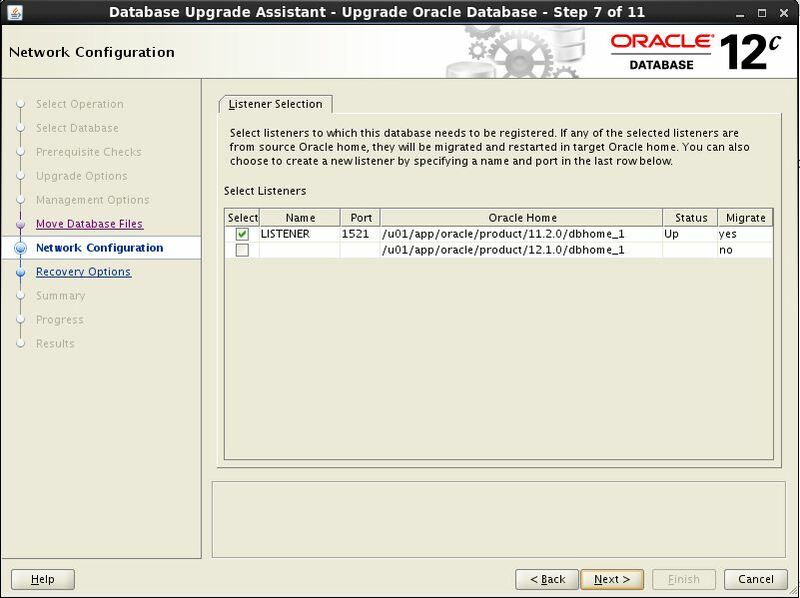 The database upgrade assistant utility has been significantly improved, over the previous releases, in Oracle 12c. Using this you don’t have to perform any upgrade pre-requisites as everything will be done by the DBUA itself. Just make sure that your database is up and running and your current environment parameters are set to 12c. Then just run the DBUA utility. The first screen allows you to choose what you want to do. 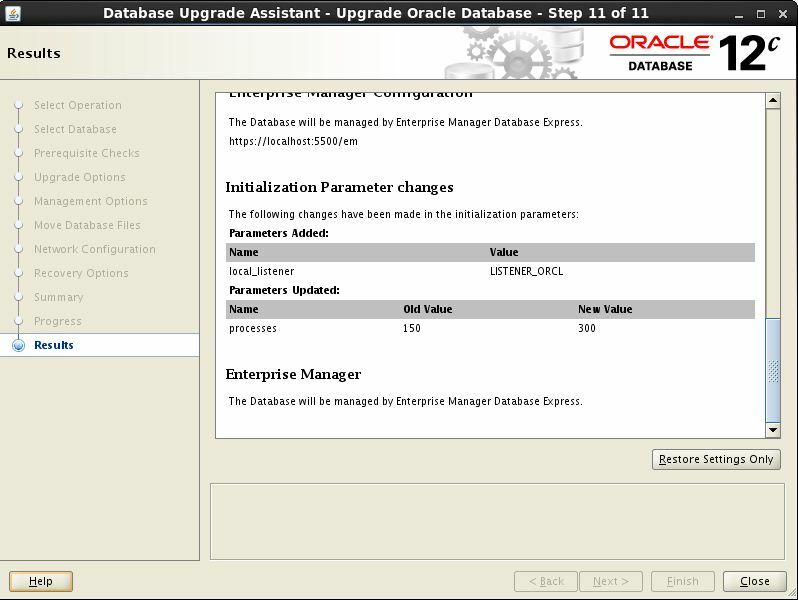 You can upgrade a database or you can just move a database from a different Oracle Home to your current one. In this case let’s choose the first option. 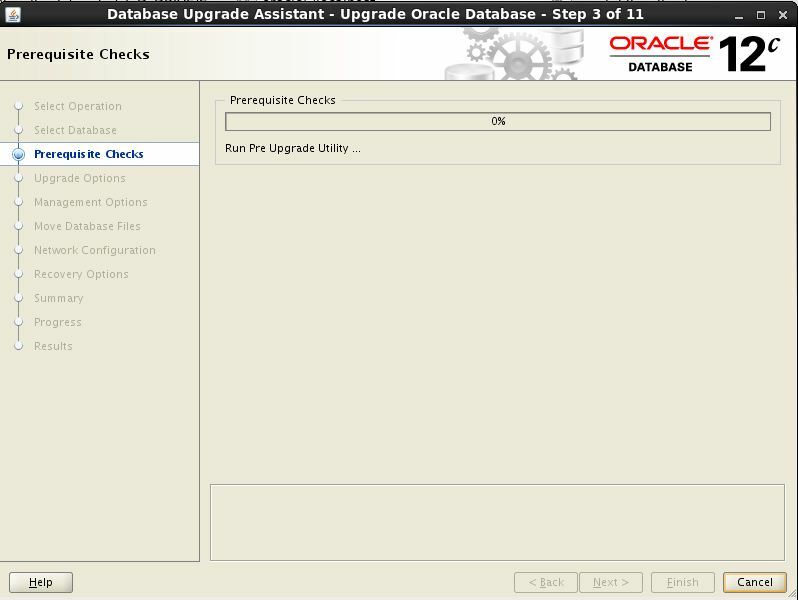 The next screen allows you to select a database for upgrade. It will show you the source and the target Oracle Homes and their database versions. Choose your database. In our case it was only one i.e. orcl. The upgrade assistant will now check for pre-requisites and will show the results on next screen. There are two warnings as you can see. One of them is related to Db Console repository. Before 12c every database had a DB Console which has been deprecated in 12c and EM Express is used instead. Clicking on More Details link below will show how you can remove EM repository. Although its not required for successful upgrade to remove DB Console data but still its good practice and will save you time during upgrade. So log into your database and run the “emremove.sql” script located in 12c home in RDBMS folder. The second warning is related to network packages used in source database and as you can see it has value Yes in Fixable column. So you can just leave this as it is and DBUA will fix it itself. You can ignore this as well and it will work. 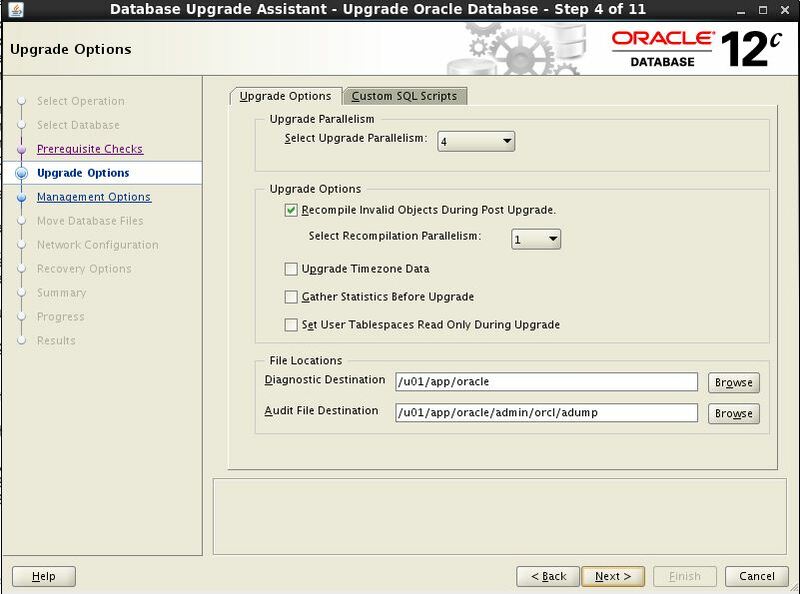 Here you can set different options for upgraded database. Click Next when you are OK.
You can choose whether you want to configure EM Express for database or not. You can also choose to register with EM Cloud if you already have. This screen will allow you to move data files to new location if you want to. You can also set the new location for Flash Recovery Area. You can upgrade the existing Listener as part of upgrade or you can configure a new one. You can schedule a backup as well. The database upgrade has started and may take sometime to complete depending on the size of your database and also options you choose during Wizard. Once completion shows 100% you can use the link Review Results to view summary of what has been done. Click Close to end the Upgrade Assistant. The upgrade has been completed successfully. You can verify it by logging into your database and confirming the new version. The DBUA is good for quick database upgrades. It is very simple to use and Oracle had pretty much mae it automatic. However, there may be a situation where you want to control every aspect of the upgrade. In that case you can use the manual upgrade process. In this section we will demonstrate the manual upgrade process. 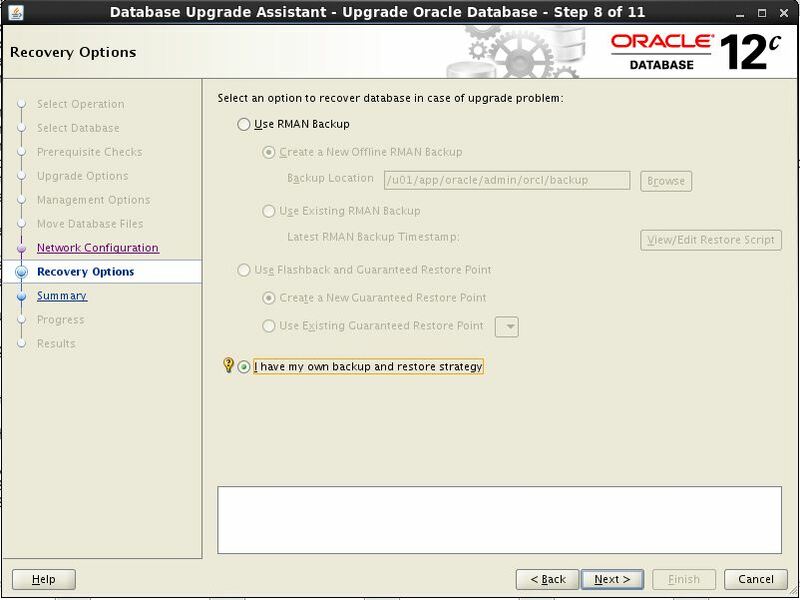 Again here we will assume the same scenario of having to upgrade a the ORCL database from 11.2.0.3 to 12.1.0.0. We will start by copying the below mentioned two scripts from new Oracle 12C home to a temporary directory. Now log into your database which is required to be upgraded (in our case its called orcl) and execute the pre-upgrade script. This script will check if database is OK to be upgraded. The script produced three files. One of them is log file which will show if its OK to upgrade the database or not. The other two files are scripts which should be run before and after the upgrade process. The log file in our case did not listed any showstoppers. However there were some actions required to be performed. For example setting the Processes parameter value to 300 and dropping the DB Console repository. The pre-upgrade fix up script will perform all these actions. So Next we will run the pre-upgrade fix up script which was created by previous script and located in location as specified below. 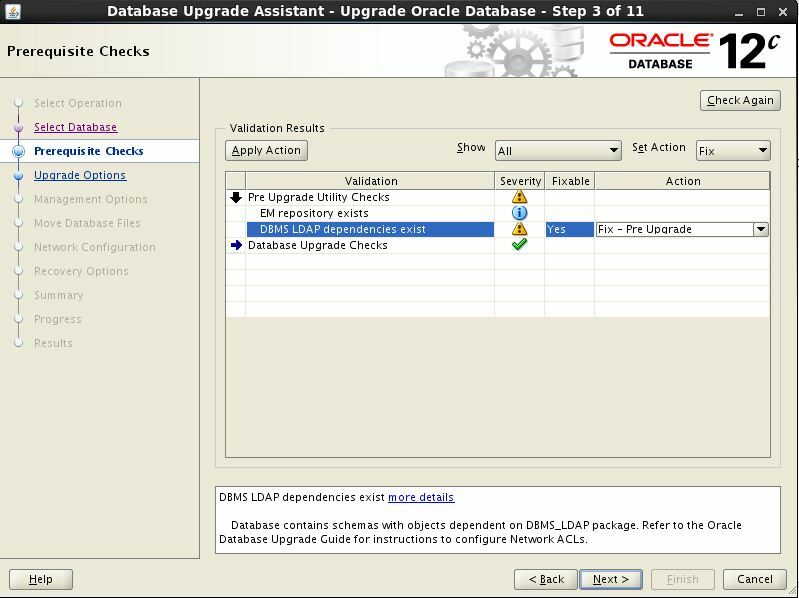 Starting with Oracle Database 12c, OLAP is desupported. Any steps that it could not perform will be listed in Manual Action Suggested section. As you can see above it is empty which means that we are now ready to perform the upgrade. First copy the SPFile and Password files from 11g home to 12c home. Now set the ORACLE_SID environment parameter to ORCL but ORACLE_HOME to new 12C home. Here is how you can do this. Now open the database in Upgrade mode. Before logging in using this method first make sure that database is closed in 11g home. Exit SQL*PLUS and run the actual upgrade script using shell window as shown below. This script will take sometime and has lengthy output and I have uploaded it here for your viewing. The database has been upgraded and you can check the status by running the utlu121s.sql script as shown below. As you can see all the components are in valid state except for Oracle Server which is in Upgraded state. Run the following script – this is just to make sure that upgrade gets successful. The upgrade may or may not had executed this script as part of it. Finally run the post upgrade script. The below mentioned steps are optional but recommended. First is to gather statistics. Compile the objects which may have been invalidated during the upgrade. The script will compile all objects within database. You can check if there are still invalid objects or not using the following. Check the status of overall upgrade process again. As you can see the Oracle Server is also in the valid state now. Log out and log in again and run the following commands to verify the upgrade process. I have multiple instances associated with my 11g ORACLE_HOME. I do not have a 12C multitenant license. Will I have to install a 12C ORACLE_HOME for each 11g instance to be upgraded as a non-cdb? Is there a way multiple non-cdb’s under one 12C ORACLE_HOME? You need a multitenant license only if you plan on converting your instances into CDB/PDB container databases. For your current single instance databases you can upgrade them directly to single instance non-CDB databases. They can all be created in the same 12c home. Could you please through some light on how to handle an upgrade failure ? 1. Ensure that you have valid backups of the binaries and database. 2. Also if you have a clone or snapshot at the OS/Storage before you upgrade that will greatly reduce your time to revert in-case of failure. 3. Most important of all make sure that you test the restore methods (binary and DB) in a test environment before you do the actual production upgrade. 4. You can also test the rollback of the patches in the test environment. We have currently five 11g oracle databases in 1 server. We are planning to upgrade all the databases to 12c. If we need to use multitenant architecture here, will it look like each database should be converted to cdb and its corresponding pdb (since we don’t have multitenant licence). Hi Munna – Oracle encourages us to use the new CDB/PDB architecture. Oracle documentation states that there are no additional licensing requirements if you use a single PDB inside a CDB instance. However you should verify this with Oracle Support via a Metalink ticket. Also just so that you are aware, Oracle plans on making this architecture a default in future releases where the non-CDB architecture may not exist at all. I hope this helps. Let us know what feedback you get from Oracle Support.